As you know our family is very involved in helping to abolish malnutrition in Central America. The only way we can do this is with your help. Precious little children die every day from the totally preventable condition of malnutrition. There are so many ways you can help….. On Saturday September 15th 2012 we will be hosting our 2nd annual Fundraising Dinner Banquet! Please come out and join us for what we promise to be an evening of great food and great entertainment! Tickets are $50.00 each. It will be a night where you can find out exactly how easy it is for you to help us help the people of Guatemala and Central America and have a fantastic time doing so! 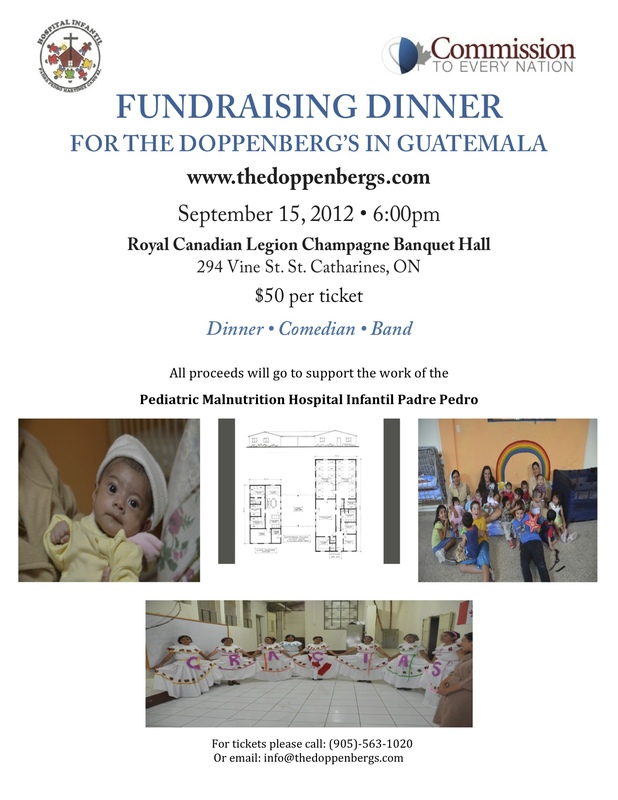 Contact us for tickets at (905) 563-1020 or email us at info@thedoppenbergs.com. You can always visit www.thedoppenbergs.com to find out more information about who we are and what we do! Thanks and we hope to see you there!!! Posted on July 21, 2012, in Guatemala Missionary, Uncategorized and tagged celebrate life, friends, grief, Guatemala, Hope, Malnutrition, mission, Missionary, Volunteers, World Impact, Youth. Bookmark the permalink. Leave a comment.